Two of the Big Four broadcast networks (ABC and Fox) have put out detailed summations of their revamped midseason schedules while NBC is dribbling out information and CBS remains silent save for the biggest splash of them all -- Super Bowl 50. Let’s spotlight some of the more notable new and returning attractions. Jan. 3 -- The whimsical, witty medieval musical Galavant returns for Season 2. It’s supposed to run for 10 episodes. Jan. 6 -- One of the standout new dramas of last season, American Crime, takes on an all-new case in Season 2. Or as ABC puts it, “Issues of sexual orientation and socioeconomic disparity come to a boil when lurid photos of a high school boy are posted on social media following a school party.” Season 1 stars Felicity Huffman, Timothy Hutton and Emmy winner Regina King return in new roles. March 2 -- A seemingly perfect family isn’t so perfect after all in the comedy series The Real O’Neals. But then “everyone stops pretending to be perfect and actually starts being real.” Martha Plimpton and Jay R. Ferguson head the cast. March 3 -- In The Family, a politician’s young son returns to the fold after being presumed dead for a decade. But not so fast. Is he really who he says he is, or should the family build a wall? Joan Allen stars as the matriarch. March 8 -- Bumped from the fall schedule, Of Kings and Prophets at least will arrive before Easter. The official network of The Ten Commandments describes it thusly: “An epic biblical saga of faith, ambition and betrayal as told through the eyes of the battle-weary King Saul, the resentful prophet Samuel and the resourceful young shepherd David -- all on a collision course with destiny that will change the world.” Well then. Ray Winstone stars as Saul. March 24 -- Mireille Enos from AMC’s The Killing and the resilient Peter Krause head the cast of The Catch, with Shonda Rhimes (Grey’s Anatomy, Scandal, How to Get Away with Murder) running the show. Enos plays a topflight L.A. private investigator who’s intent on payback after her fiancé (Krause) cons her out of millions of dollars and then vanishes. Jan. 3 -- The new Cooper Barrett’s Guide to Surviving Life chronicles the “charming misadventures” of the title character and his misfit friends. Fox says their “hilarious disasters” include a night in jail, crazy ex-girlfriends, going broke and the heartbreak of psoriasis. OK, not the last one. Newcomer Jack Cutmore-Scott stars. Jan. 3 -- Bordertown debuts as a cartoon series taking a “satirical look at the cultural shifts taking place in America.” Voice actors include Alex Borstein, Hank Azaria and Judah Friedlander. Jan. 4 -- The “reality-competition” series Superhuman assembles 12 contestants with supposedly extraordinary abilities. They then battle for a grand prize of $100 grand, which frankly doesn’t really seem like a super sum. Comedian Kal Penn hosts, with the likes of Mike Tyson and Mary Lynn Rajskub popping in as guest commentators. Jan. 5 -- New Girl returns for its fifth season. Jan. 6 -- Here comes the most powerful TV series of this century, American Idol, for its 15th and final go-around. Judges Jennifer Lopez, Harry Connick, Jr. and Keith Urban all return, with Simon Cowell, Paula Abdul and an array of past champs (maybe even including Taylor Hicks) also sure to show up at some point. Jan. 13 -- Rob Kazinsky (True Blood) heads the cast of the new drama series Second Chance. Fox says he plays a “disgraced, 75-year-old ex-sheriff who dies at the hands of corrupt cops.” But then he’s “brought back to life by a pair of young tech scientists who are founders of a social networking empire -- and given a second chance as a 35-year-old with unpredictable near-superhuman abilities.” Sounds about as plausible as the Jacksonville Jaguars winning the Super Bowl. But hey, this is television. Jan. 25 -- The new drama Lucifer stars Tom Ellis (Merlin) as Lord of Hell Lucifer Morningstar, who’s now fired up about retiring in L.A. But then he meets a homicide detective and is infatuated by her “compassion for humanity.” Inner conflict ensues. Jan. 31 -- Fox takes a page from NBC and presents Grease: Live. It’s gonna be three hours, and the singing/dancing cast includes Julianne Hough, Vanessa Hudgens, Aaron Tveit, Keke Palmer, Mario Lopez, Ana Gasteyer and Carly Rae Jepsen. March 30 -- Empire’s so-called “spring premiere” dawns after a lengthy hiatus. Its “fall finale” is scheduled for Dec. 2nd. After that, eight new episodes will remain from an 18-episode Season 2. Dec. 3 -- NBC’s latest musical extravaganza, The Wiz Live!, stars Shanice Williams as Dorothy and also will include Queen Latifah, Mary J. Blige, Uzo Aduba, David Alan Grier, Common and Ne-Yo in supporting roles. The Broadway original dates back to 1975, with a 1978 feature film adaptation fronted by Diana Ross and Michael Jackson. This is NBC’s third full-blown holiday season musical, following The Sound of Music Live! and Peter Pan Live! Jan. 4 -- The new comedy Superstore will sneak-preview on Nov. 30th before resuming as a weekly series on this date. America Ferrera and Ben Feldman head the cast. All involved “hilariously tackle the day-to-day grind of rabid bargain hunters, riot-causing sales and nap-worthy training sessions.” Sponsored by Wal-Mart? Probably not. Jan. 4 -- NBC has a jones for sneak-previewing, so Telenovela also will get an early jump start on Dec. 7th before settling in on this date. Eva Longoria is both the executive producer and star, playing Spanish language soap star Ana Sofia -- who doesn’t speak Spanish. And uh-oh, her ex-husband is resurfacing as Ana’s new on-screen love interest. 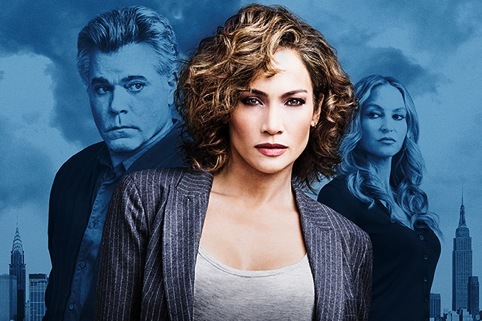 Jan. 7 -- Jennifer Lopez plays NYPD detective Harlee Santos in the new drama series Shades of Blue. She’s also a single mom with financial problems who must choose between “doing the right thing” or covering up for her corrupt cop colleagues. Ray Liotta joins in as Lt. Bill Wozniak and former Sopranos co-star Drea de Matteo gets another shot as Det. Tess Nazario. The show premieres on the same night as Idol’s second two-hour episode of Season 15, but not directly against it. Feb. 7 -- We don’t know the teams yet, but we do know that Super Bowl 50 again is certain to be the season’s most-watched TV event. CBS says its post-Supie attraction will be a live edition of Late Show with Stephen Colbert. It’s the first time a late night talker has landed this coveted slot.